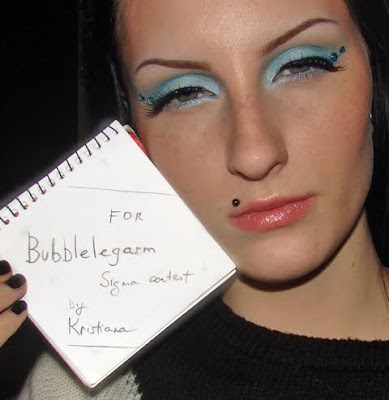 B U B B L E G A R M: Sigma Contest Winners! Today is the day to reveal the 4 winners. Thank you to everyone who entered the Sigma 'Make Me Up' Contest, I had an overwhelming amount of entries and I am saddened that there can not be more winners. It was so hard making the final decisions. I appreciate your effort and time that has gone into the contest, and wish I could reward all of you. Her look is so simple, creative and striking and captured my attention as soon as I saw it. This look is clean and crisp, the teal colour manages to look sultry without losing the fun and fresh feel. The sequins add a pop of glamour without becoming overpowering. 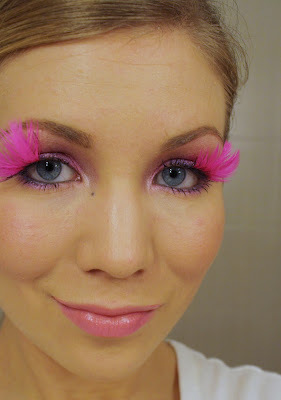 I love the creativity and striking block of colour with the use of the pink feather, her look is flirty and feminine without looking too sweet. It's incredibly cute and fresh! I love the rock chick feel to this look, it's dark and daring but eye opening. I love the way she has contoured her eye and added dimension to her look. Very nice looks. great work guys! and congrats! All these makeup looks are so creative. Congrats! I forgot to enter, I will next time. wow! these looks are all amazing! what are these people's links to their blogs/yt channels if they have one? their looks all look great so I wanna subscribe to them!! these are all great...purple is one of my favorite colors to use, and sarah in particular caught my attention. nice! congratulations!! great looks, love the black one!! Wow all the looks were amazing, congrats to the winners! wow really good looks :) well done to the four winners! Loved the black and the purple. Oh my :) Thank you so much for choosing my make up. Love all the looks ! I'm super new to blogging and I came across your blog Mushine, everything is so fab! I think its great you have contests like this and I hope to be a part of them in the future! XO! Great looks! Congrats for the winners! Everyone has put in so much effort and the looks are so beautiful(well done everyone!) but my favourite one has to be Magda's look. I dont know how she did those square cubes at the side but it looks so cool!! Nicely done! I'm curious to know what brand/shade of silver eyeshadow Sarah is wearing. I need some more shimmer in my life. Oh my god, thankyou SO much! I'm...speechless. 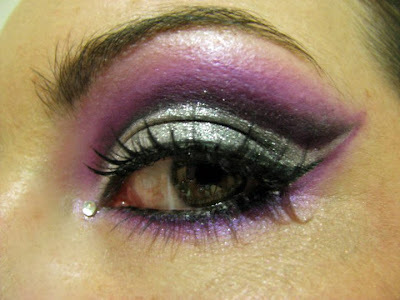 The silver eyeshadow in my purple look is Tiara chromalust by Sugarpill Cosmetics, an amazing colour. Congratulation to the creative & original winners! Wow. Those are some pretty well done looks. Great picks you made. Nice blog. molto carino il tuo blog..io ti seguo! Wow the first one is stunning!